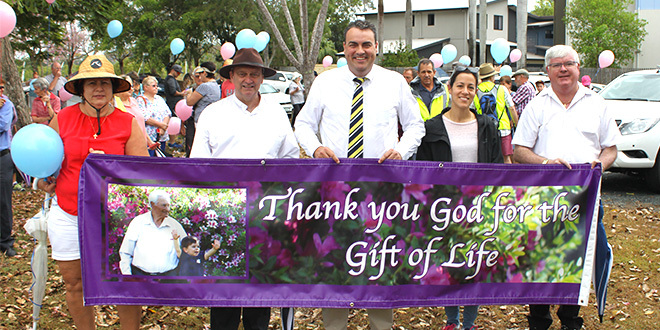 Speaking out: (From left) Pauline Lamb, Fr Don White, Jason Costigan, Dr Ciara Ross and Fr Stephen Hanly at the fourth annual March for the Babies in Mackay last weekend. PROPOSED abortion legislation has been labelled “brutal and horrific” by a pro-life speaker at the fourth annual March for the Babies in Mackay attended by more than 150 people last weekend. The march and rally was in opposition to the Labor Government’s Termination of Pregnancy Bill, which would allow for abortion up to 22 weeks’ gestation, and after 22 weeks with the approval of two doctors. Lina Martin, from Cherish Life’s Mackay branch, criticised the vagueness of the bill. “(Having an abortion) for social reasons creates a loophole wide enough to make any reason for abortion acceptable under law,” Mrs Martin said. Mrs Martin also condemned the partiality of the Abortion Law Reform Commission. “It was severely biased to the pro-abortion side, with more pro-abortion or pro-choice politicians, doctors, lawyers and witnesses than pro-life. “This bill is among the worst of its kind – brutal and horrific in every form. “Members of the Labor Government would advocate that this bill endorses healthcare for women, when really there are no safeguards, no informed consent and no independent counselling for women, and definitely no healthcare for the unborn child.